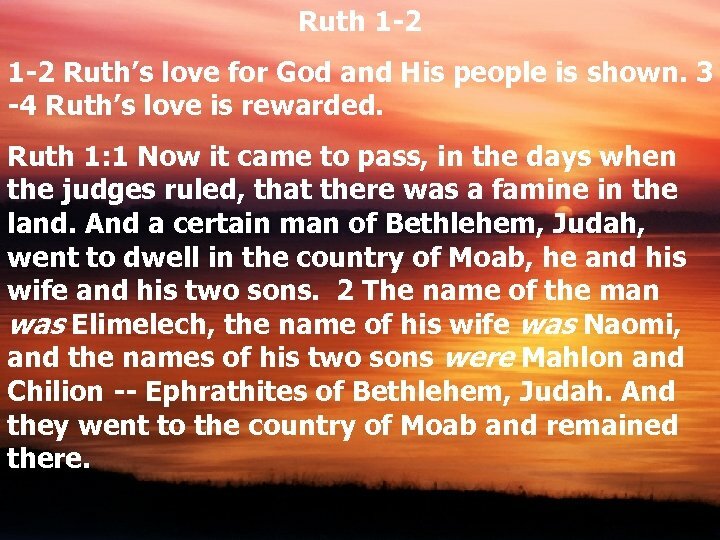 Ruth 1 -2 Ruth’s love for God and His people is shown. 3 -4 Ruth’s love is rewarded. Ruth 1: 1 Now it came to pass, in the days when the judges ruled, that there was a famine in the land. And a certain man of Bethlehem, Judah, went to dwell in the country of Moab, he and his wife and his two sons. 2 The name of the man was Elimelech, the name of his wife was Naomi, and the names of his two sons were Mahlon and Chilion -- Ephrathites of Bethlehem, Judah. And they went to the country of Moab and remained there. 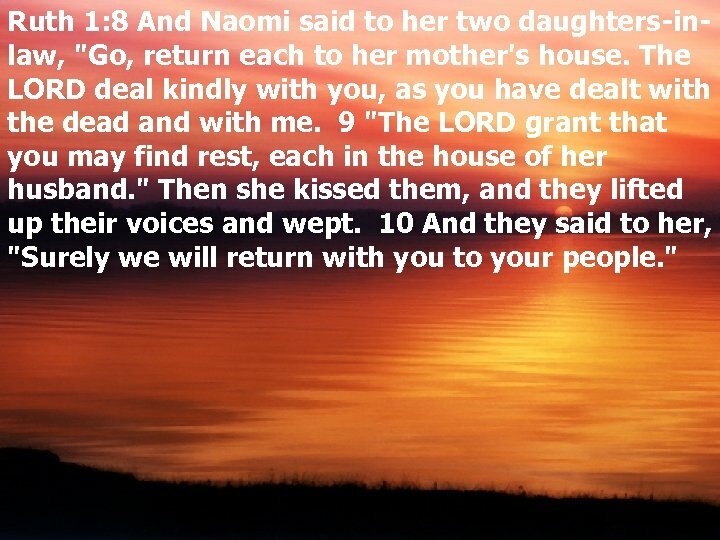 Ruth 1: 8 And Naomi said to her two daughters-inlaw, "Go, return each to her mother's house. The LORD deal kindly with you, as you have dealt with the dead and with me. 9 "The LORD grant that you may find rest, each in the house of her husband. " Then she kissed them, and they lifted up their voices and wept. 10 And they said to her, "Surely we will return with you to your people. " 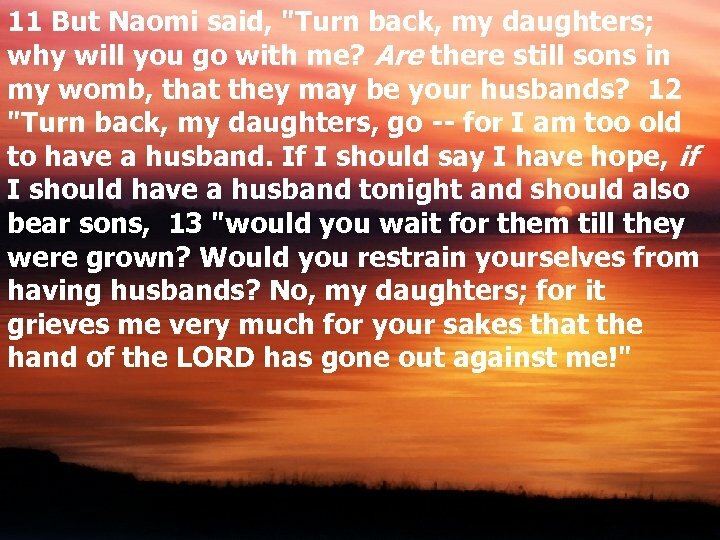 11 But Naomi said, "Turn back, my daughters; why will you go with me? Are there still sons in my womb, that they may be your husbands? 12 "Turn back, my daughters, go -- for I am too old to have a husband. If I should say I have hope, if I should have a husband tonight and should also bear sons, 13 "would you wait for them till they were grown? Would you restrain yourselves from having husbands? No, my daughters; for it grieves me very much for your sakes that the hand of the LORD has gone out against me!" 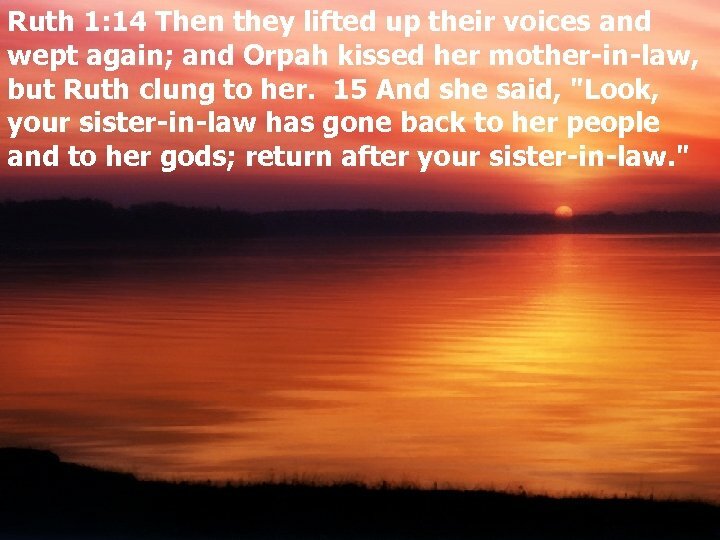 Ruth 1: 14 Then they lifted up their voices and wept again; and Orpah kissed her mother-in-law, but Ruth clung to her. 15 And she said, "Look, your sister-in-law has gone back to her people and to her gods; return after your sister-in-law. " 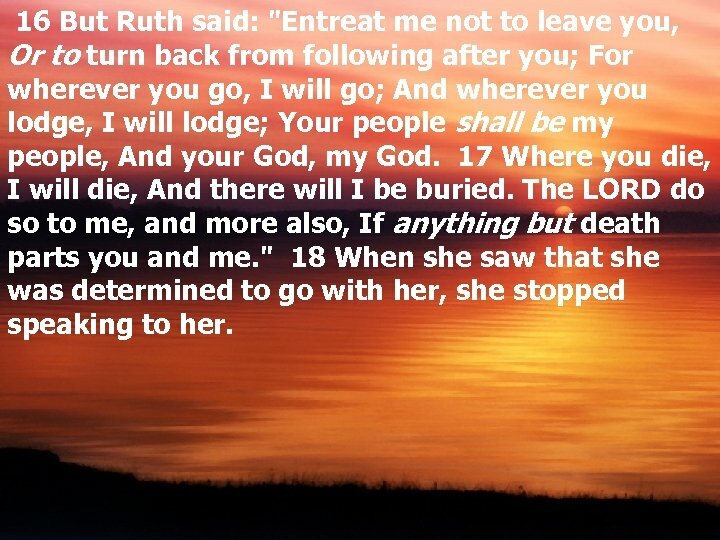 16 But Ruth said: "Entreat me not to leave you, Or to turn back from following after you; For wherever you go, I will go; And wherever you lodge, I will lodge; Your people shall be my people, And your God, my God. 17 Where you die, I will die, And there will I be buried. The LORD do so to me, and more also, If anything but death parts you and me. " 18 When she saw that she was determined to go with her, she stopped speaking to her. Matthew 10: 37 "He who loves father or mother more than Me is not worthy of Me. 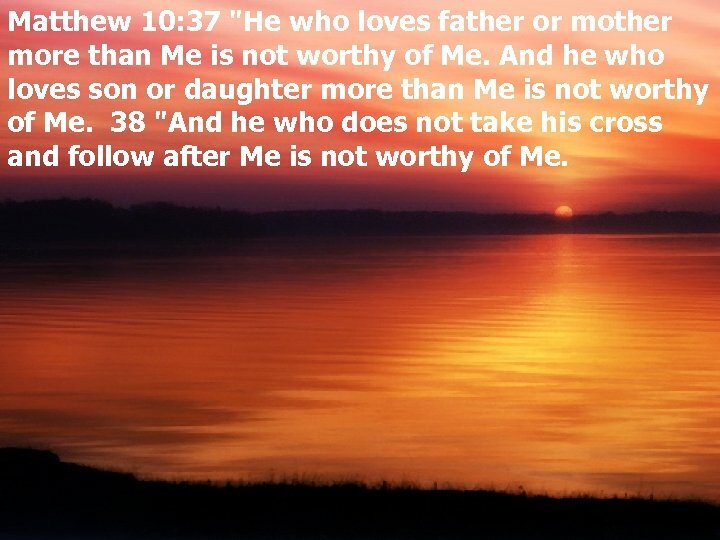 And he who loves son or daughter more than Me is not worthy of Me. 38 "And he who does not take his cross and follow after Me is not worthy of Me. Ruth 1: 19 Now the two of them went until they came to Bethlehem. And it happened, when they had come to Bethlehem, that all the city was excited because of them; and the women said, "Is this Naomi? " 20 But she said to them, "Do not call me Naomi; call me Mara, for the Almighty has dealt very bitterly with me. 21 "I went out full, and the LORD has brought me home again empty. Why do you call me Naomi, since the LORD has testified against me, and the Almighty has afflicted me? " 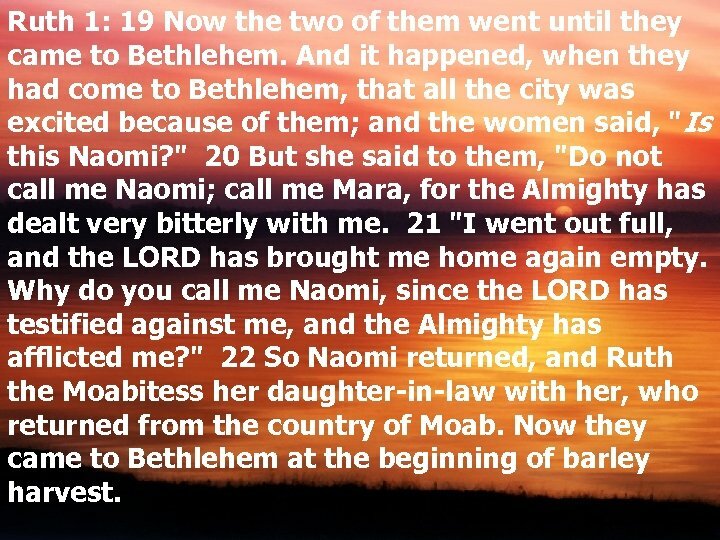 22 So Naomi returned, and Ruth the Moabitess her daughter-in-law with her, who returned from the country of Moab. Now they came to Bethlehem at the beginning of barley harvest. woman is this? " 6 So the servant who was in charge of the reapers answered and said, "It is the young Moabite woman who came back with Naomi from the country of Moab. 7 "And she said, 'Please let me glean and gather after the reapers among the sheaves. ' So she came and has continued from morning until now, though she rested a little in the house. " 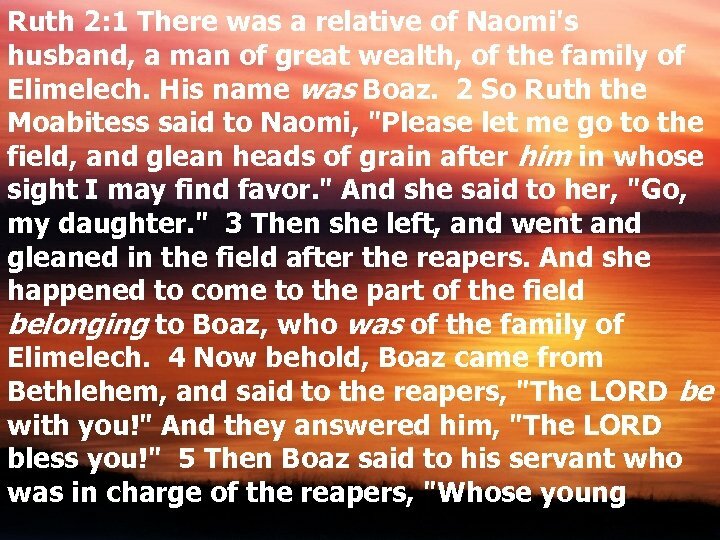 8 Then Boaz said to Ruth, "You will listen, my daughter, will you not? Do not go to glean in another field, nor go from here, but stay close by my young women. 9 "Let your eyes be on the field which they reap, and go after them. Have I not commanded the young men not to touch you? 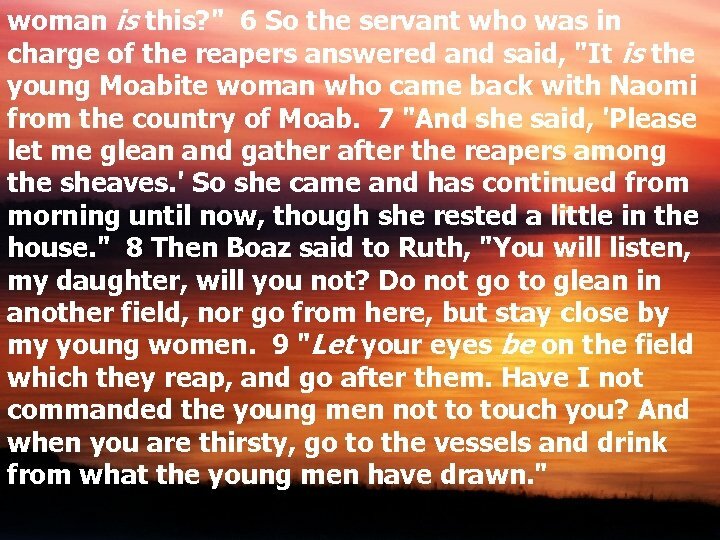 And when you are thirsty, go to the vessels and drink from what the young men have drawn. " Leviticus 19: 9 ' When you reap the harvest of your land, you shall not wholly reap the corners of your field, nor shall you gather the gleanings of your harvest. 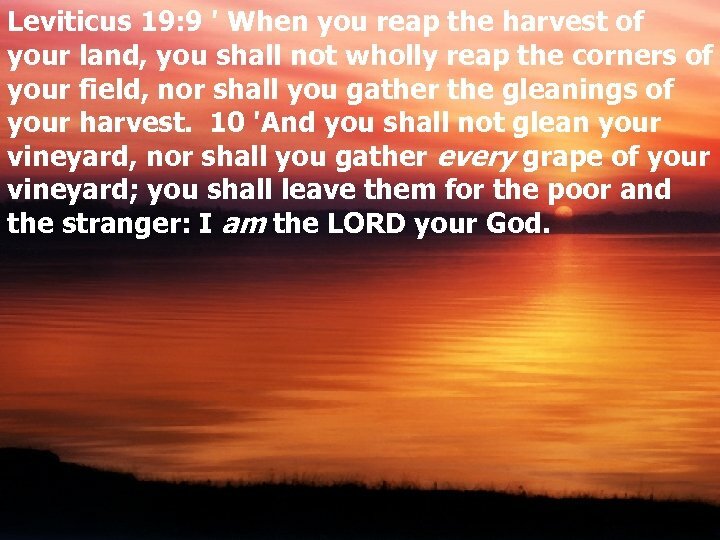 10 'And you shall not glean your vineyard, nor shall you gather every grape of your vineyard; you shall leave them for the poor and the stranger: I am the LORD your God. 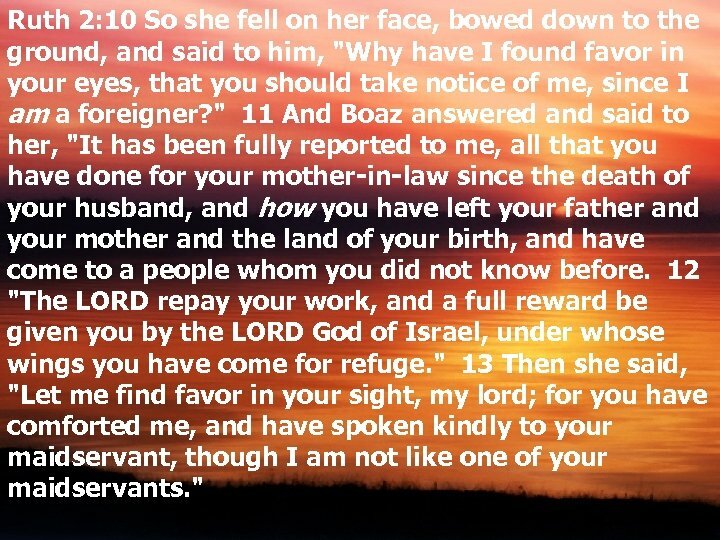 Ruth 2: 10 So she fell on her face, bowed down to the ground, and said to him, "Why have I found favor in your eyes, that you should take notice of me, since I am a foreigner? " 11 And Boaz answered and said to her, "It has been fully reported to me, all that you have done for your mother-in-law since the death of your husband, and how you have left your father and your mother and the land of your birth, and have come to a people whom you did not know before. 12 "The LORD repay your work, and a full reward be given you by the LORD God of Israel, under whose wings you have come for refuge. " 13 Then she said, "Let me find favor in your sight, my lord; for you have comforted me, and have spoken kindly to your maidservant, though I am not like one of your maidservants. " 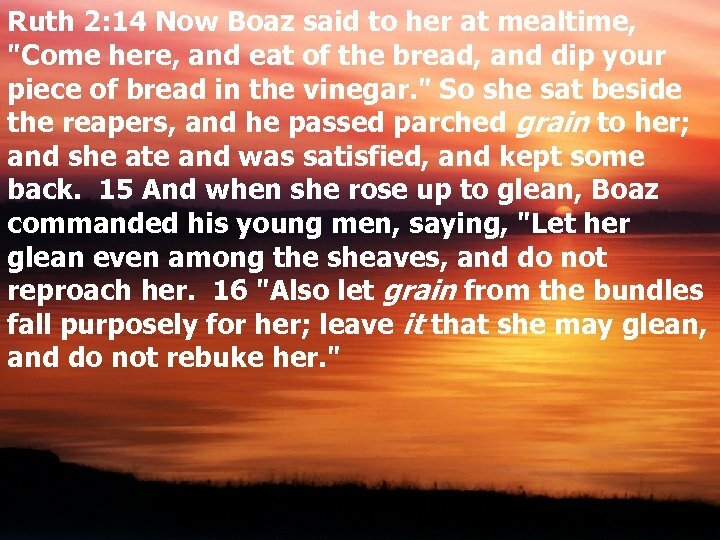 Ruth 2: 14 Now Boaz said to her at mealtime, "Come here, and eat of the bread, and dip your piece of bread in the vinegar. " So she sat beside the reapers, and he passed parched grain to her; and she ate and was satisfied, and kept some back. 15 And when she rose up to glean, Boaz commanded his young men, saying, "Let her glean even among the sheaves, and do not reproach her. 16 "Also let grain from the bundles fall purposely for her; leave it that she may glean, and do not rebuke her. " Ruth 2: 17 So she gleaned in the field until evening, and beat out what she had gleaned, and it was about an ephah of barley. Ruth 2: 18 Then she took it up and went into the city, and her mother-in-law saw what she had gleaned. So she brought out and gave to her what she had kept back after she had been satisfied. 19 And her mother-in-law said to her, "Where have you gleaned today? And where did you work? Blessed be the one who took notice of you. " 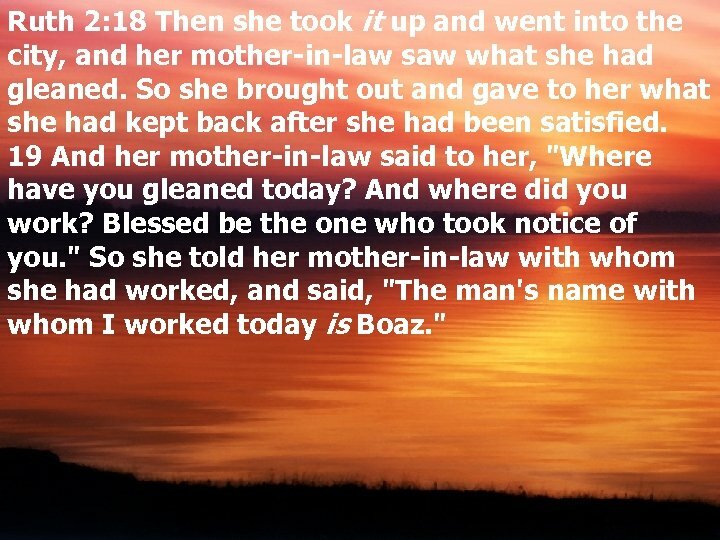 So she told her mother-in-law with whom she had worked, and said, "The man's name with whom I worked today is Boaz. " Matthew 9: 37 "The harvest truly is plentiful, but the laborers are few. 38 "Therefore pray the Lord of the harvest to send out laborers into His harvest. " 20 Then Naomi said to her daughter-in-law, "Blessed be he of the LORD, who has not forsaken His kindness to the living and the dead!" And Naomi said to her, "This man is a relation of ours, one of our close relatives. " 21 Ruth the Moabitess said, "He also said to me, 'You shall stay close by my young men until they have finished all my harvest. ' 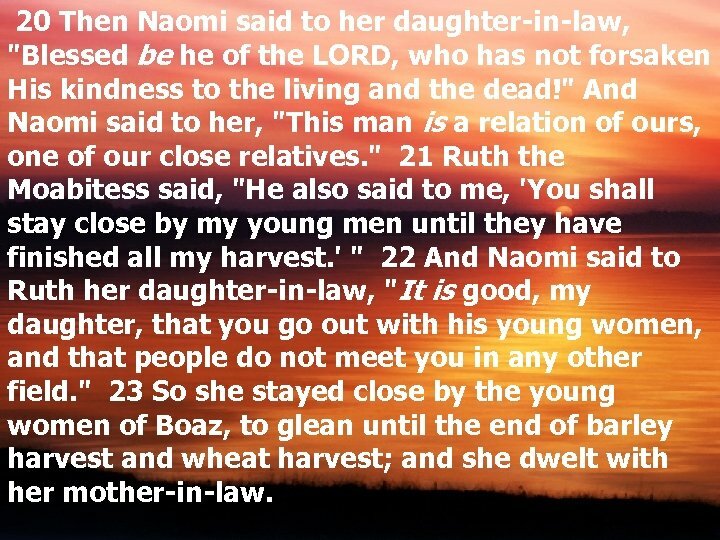 " 22 And Naomi said to Ruth her daughter-in-law, "It is good, my daughter, that you go out with his young women, and that people do not meet you in any other field. " 23 So she stayed close by the young women of Boaz, to glean until the end of barley harvest and wheat harvest; and she dwelt with her mother-in-law. Romans 8: 28 And we know that all things work together for good to those who love God, to those who are the called according to His purpose.